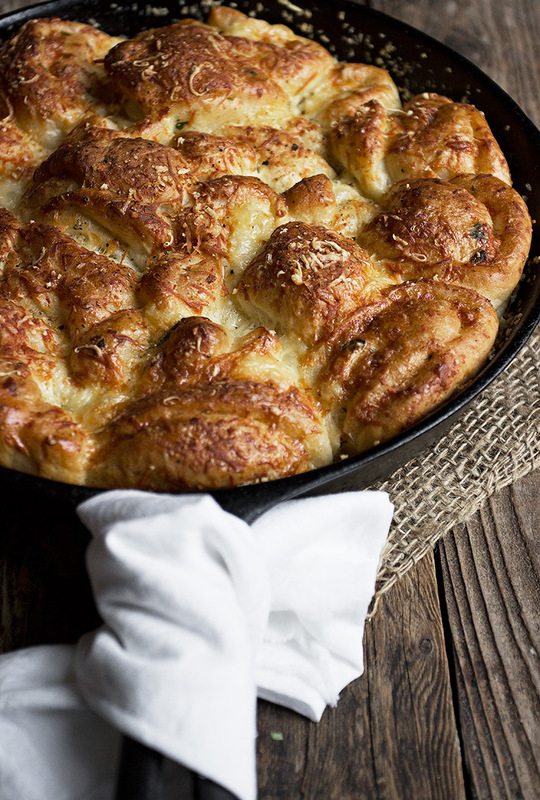 Delicious Pull-Apart Caesar Salad Bread, made two ways. Filled with the flavours of Caesar salad – mayonnaise, garlic, lemon, Parmesan and mozzarella cheese. 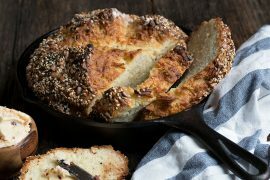 Made as a skillet or loaf pull apart bread. I know this is an odd sounding name for a bread. Just to assure you off the top – there isn’t actually a Caesar salad hiding anywhere in this bread. What there is though is all the best flavours of Caesar salad! Combined with warm, freshly baked bread. And it’s insanely good. And the smell when it’s baking is heavenly. 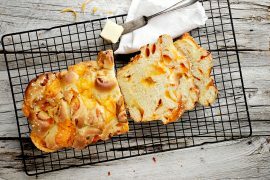 And yes, you must try it the next time you’re in the mood for a decadent loaf (or skillet) of garlic cheese bread. I have made this bread many times and experimented with different shapes. 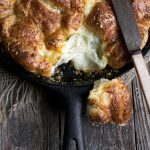 I love the pull-apart skillet for times when I just want to place it on the table and let everyone dig in. It’s great with soup or chili. 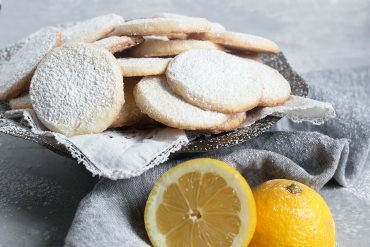 As the filled dough is cut in to chunks, the great flavour infuses all the little bread bites beautifully. When I feel more like a slice, I go the loaf route. It’s also pull-apart, but a whole slice this time. 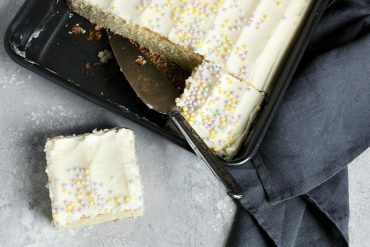 It bakes up with a super soft, moist and flavour-soaked middle, encased in a crispy crust. It’s the best of both worlds when it comes to cheesy garlic bread. Speaking of crispy outside, that is thanks to the panko dusting that the pan gets. It’s a great technique for a lovely, crispy crust. The loaf bread shown here was baked in my 4×11-inch loaf pan. I’m thinking a 9×5 would be roughly equivalent. An 8×4 would probably be a tight fit. 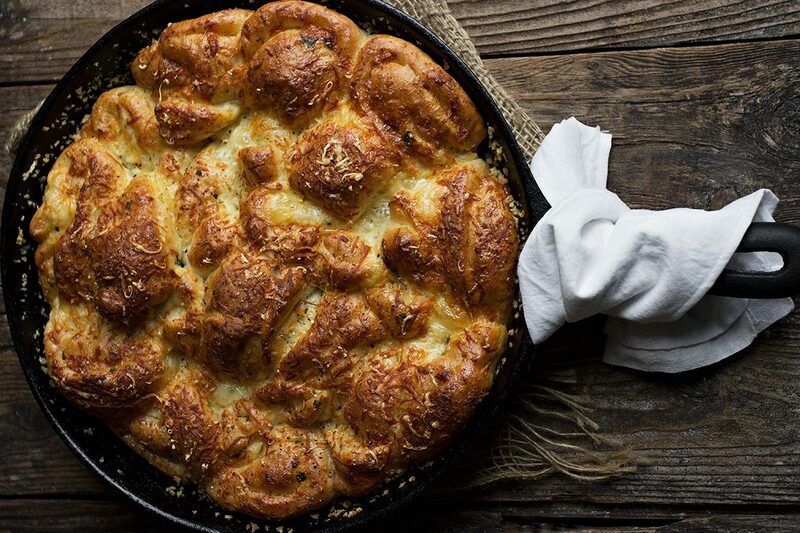 To do a round of pull-apart bites, use any baking dish that is roughly 10-inches in diameter – a skillet, springform pan or cake pan. 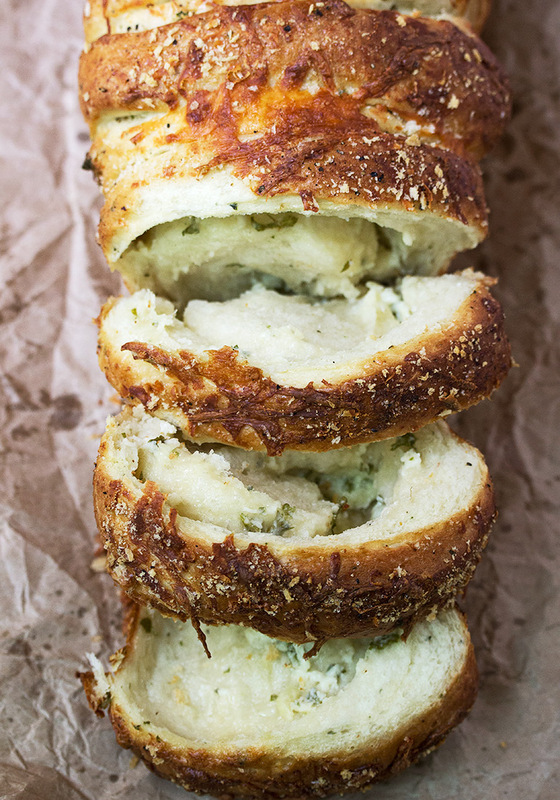 Delicious garlic bread, filled with the flavours of Caesar salad. 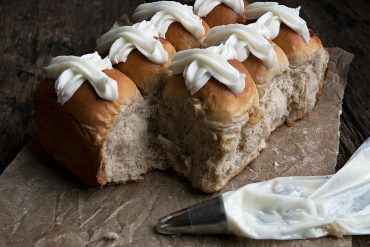 Can be made as a skillet or loaf pull-apart loaf. Grease 9x5 loaf pan, skillet or 10-inch round springform or round cake pan with olive oil. Sprinkle with panko and tip to coat evenly. Set aside. 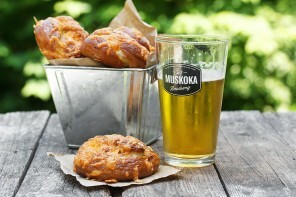 In a large bowl or the bowl of a stand mixer fitted with a kneading hook, whisk together the water and yeast. Let stand a few minutes. Add oil, sugar, salt, Italian seasoning, garlic powder and about 4 cups of the flour. Mix and then knead, adding more flour in small increments, as necessary, to form a soft, moist dough. Cover bowl with plastic wrap and allow to rise for 45-60 minutes, or until almost doubled. Meanwhile, prepared the filling by stirring together all the filling ingredients. Set aside. When dough has risen, remove to a flour dusted work surface and gently deflate. Roll dough in to a rectangle about 1/2 inch thick. Spread filling over dough, then roll up dough jelly-roll style. For loaf: Cut jelly roll in to 8-10 slices. Snug slices next to each other in prepared loaf pan. For Pull-apart Skillet or round dish: Using a sharp knife or bench scraper, chop jelly roll in to irregular pieces, about 1 - 1 1/2 inches. 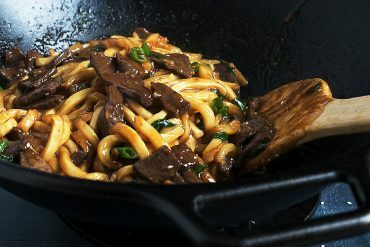 Scatter dough pieces in prepared skillet or round baking dish. Beat egg in a small bowl, then brush over dough. Sprinkle with garlic powder, salt and pepper, then scatter a bit more Parmesan and mozzarella over top. Drizzle with a bit of olive oil, over-top. Cover with plastic wrap and let rise until dough is puffy, about 45-60 minutes. Preheat oven to 375 F. Bake 20 minutes at 375 F., then reduce oven to 350 F. and bake for a further 20-30 minutes, or until nicely browned and cheese is melted. This is very tasty bread for dinner ! I just made now. Taste was very good !! But After raising bread prossed was humongassize ! Almost double size that I was expecting (or your picture) that came out over from 9 inch round bake pan !! Do you think too much yeast for that ? I’m wondering…. Yes, I will do shorter rise time and larger pan next time !! Thank you . I made this over the weekend in my cast iron skillet and it is very good. Your recipe as printed calls for 2T of yeast…..did you mean 2t? I made it with 2t and it raises fine….thinking 2T is a lot of yeast for the amount of flour. Glad you enjoyed it! And no, it really is 2 tablespoons of yeast. Insanely good is right! This is the kind of bread I have absolutely no willpower around! I was swooning when I saw this on IG and I’m still reeling. This is everything!! Your breads always blow me away but this is so over the top delicious! Such unique, yummy flavours. So glad you share your creative ways with us! 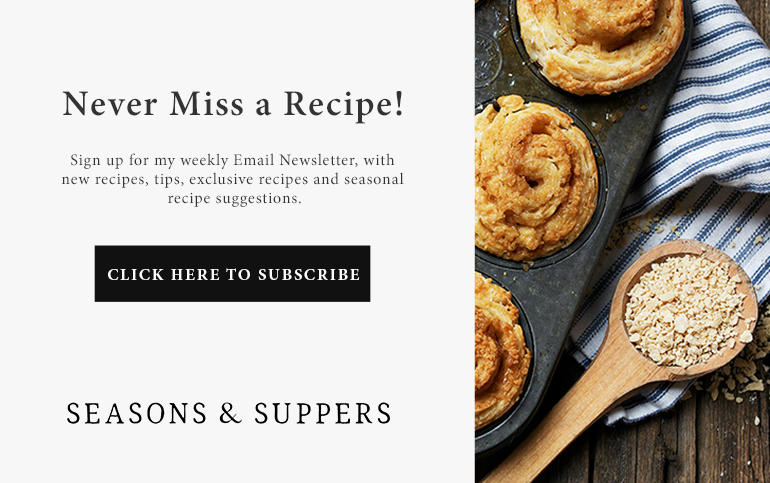 Thanks Robyn :) I do love my bread and it’s so easy (and delicious) to be creative with it! 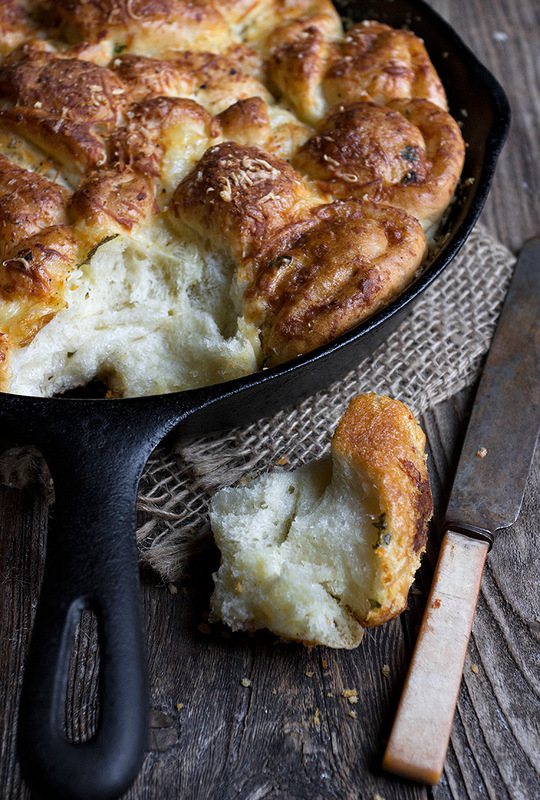 I swear, every time you post something I want to drop everything and go make it, this skillet bread looks incredible! Oh my goodness Jennifer! Both versions of this bread look totally scrumptious! 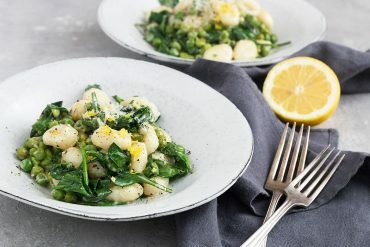 I absolutely LOVE caesar salads, so I’ve got to try this! I dream about bread like this and love that you baked it two ways, but now I have to choose. Mayonnaise in the filling is just brilliant. I can almost smell it now baking away in my oven. I could bake everyday but then I would want to eat it all myself while it was warm and tender. I should have eaten breakfast for coming to see you this morning, now I’m starving!